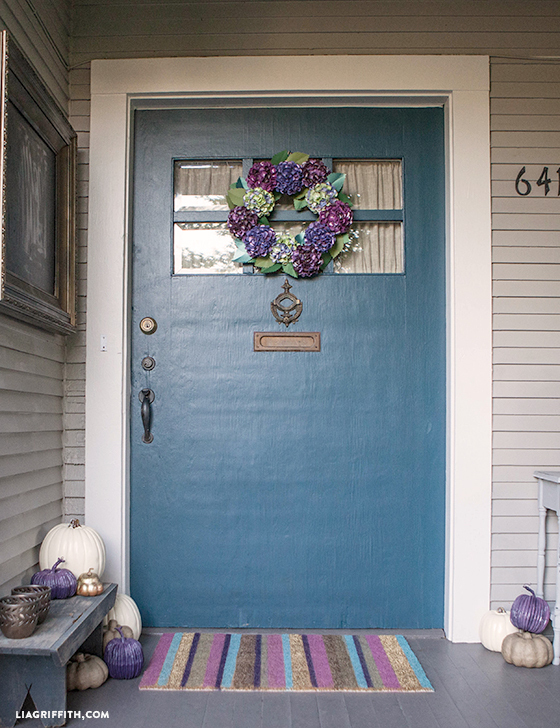 It is time for a new fall wreath for the door! And me being one who likes to push the color boundaries and traditions, decided to make it in deep plums and purples with a touch of lime. For that color palette, the paper flower of choice must be a hydrangea, right? 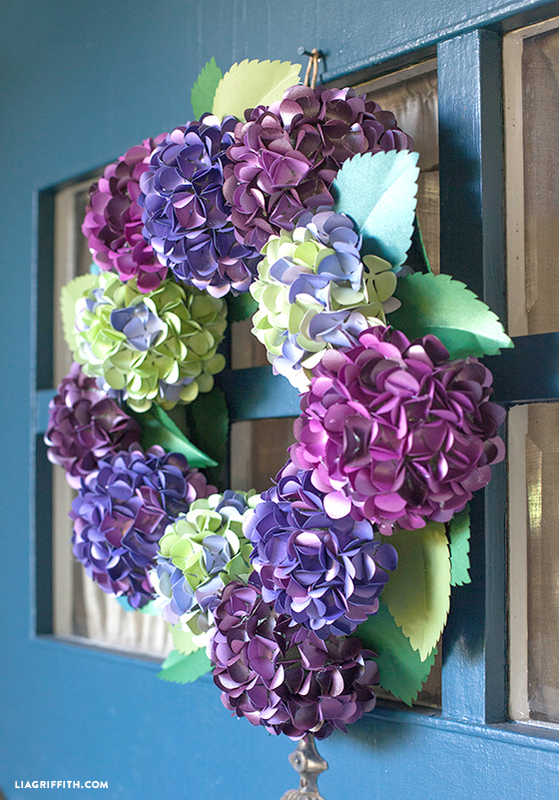 To see how I made this DIY paper hydrangea wreath, check out my tutorial below. If you love hydrangeas, another fun project to craft would be my antique paper hydrangea. Or here’s another gorgeous fall wreath you can make! For my DIY paper hydrangea wreath, I started with 5 frosted papers in text weight from PaperPapers.com. I chose Ruby, Punch, Kunzite, Violette, and Opal. And to add an extra layer of color, I printed them with a watercolor wash on a laser printer. You can download the purple, blue, and green washes here. I then chose three leaf colors: Botanic, Emerald and Fairway. I picked the Emerald to coordinate with the color of my front door, so you may choose a more traditional green if you prefer. To make the 11 flower heads, each one is a mix of two colors to add depth. I printed five sheets of each color to make 25 sheets total. Plum watercolor on Ruby, Violette, and Punch; blue watercolor on Kunzite; and green watercolor on Opal. I then used my Cricut Explore to trim the 30 petals per sheet until I had a pile of 750 petals. For the leaves, I cut three sheets of Botanic and Fairway and two of Emerald to make 48 leaves. If you do not have a cutting machine, you can use my PDF template to hand cut the petals and leaves. Once everything is cut, you can follow the tutorial below to assemble your wreath. 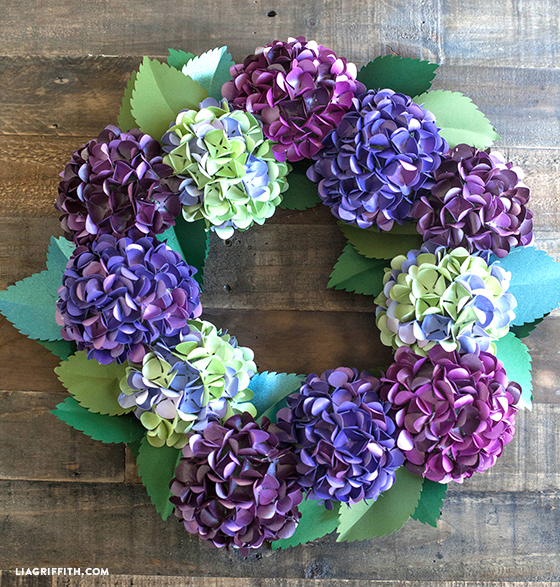 For this DIY paper hydrangea wreath, I am using a different technique than the hydrangeas I made for the hydrangea bouquet as it does not need to look as delicate on the wreath form. Instead of a wire dome, I used the 4-inch foam balls cut into half and attached to a wreath form. 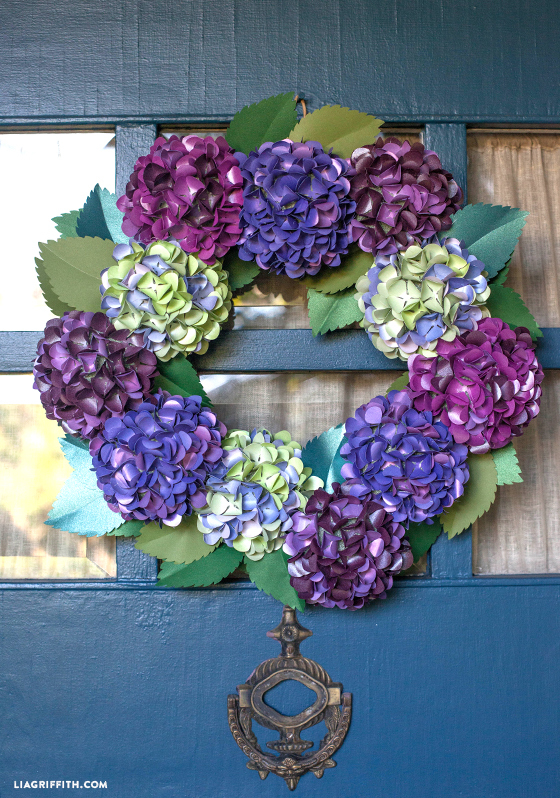 This is also a quicker method to assemble the hydrangea blooms into a wreath. Absolutely gorgeous results, don’t you think? Is there a template I could use to determine the sizes of each of the petals? Hi there, I have a quick question. I am wanting recreate my bouquet from my wedding and I had a turquoise hydrangea. How did you create the water color wash? I just wanted to say I loved doing this project! I’ve been wanting to make a hydrangea flower arrangement for a while and your diy was the best I’ve come across. I even registered just so I could use it and browse all the wonderful tutorials you have! This was so easy to understand and I really appreciated the pdf available. However, as a person with carpal tunnel and gout in my hands I found it incredibly difficult to curl every petal with the edge of my scissors. So, I took a normal wooden toothpick and curled each one, and found I saved time and pain! I just thought I’d mention it so others who have the same problem I had could save themselves ttouble. Thank you! I’ll continue to be a member for now on. I love this site. Great suggestion, thank you for sharing Christina! Hi! I can’t afford a cutting machine yet but so….want to do this project. If I cut all of these by hand it’d take an eternity. I bought a Martha Stewart hydrangea punch thinking this would be the same size and I could use that but it’s too small. Do you know of any punches that are big like the size on your pdf pattern? I just can’t cut these all out by hand. I wish they’re were places you could pay by the minute to use a cutting machine, kinda like Kinko’s but for crafts! Haha! Thanks. Love this project, so beautiful! Hi Liz! I cut all my flowers by hand before I got a cutting machine. There were a lot of late nights cutting petals watching TV and listening to music 🙂 Unfortunately I don’t know of a punch that’s the size of my design, I’m sorry! Yay, I’m so glad to hear that Lenore! Hi I love these hydrangeas I am making my wedding boutiques off your amazing flowers! I am trying to figure out in the very first picture of the wreath what two papers your used for the bloom faced at 12. I believe it’s the same bloom that’s in step 8 of your directions but I can’t figure out the paper and wash used. Thanks so much! Congratulations on your upcoming wedding! The hydrogenate is one of my all-time favorites. The one at 12 is plum printed on Violet paper. Since I will be cutting these out by hand from a homemade template how big were the petals you had cut 2″? Hi I am making my own wedding boutiques and in the first picture you have posted of the wreath I really would love to know what two papers you used for the blooms pointing at 12 and 1. I plan on using those and including some of your awesome roses! Thanks!! Hi Jen! I think I just responded to your earlier comment about the paper for the flower in 12 is violet with the plum print. Number 1 is ruby with the plum print. Sounds like it will be a lovely bouquet, please share a picture with us 😉 Congrats again! It is actually very simple. Place the Ruby, Violette and Punch papers in the printer and print the plum watercolor on those papers. How every many you think you will need. Then place the Kunzite paper in your printer and print the blue watercolor file on it, then you finish with the Opal in the printer and print the green watercolor file on that paper. I don’t know if my previous reply posted. I print the watercolor wash on top of the metallic paper. I print the water color wash on top of the colored metallic paper. Are you using a personal cutting machine? If you are cutting by hand print the template on top of the watercolor printed paper. Sounds like you purchased the colors from Paper-Papers, just print the water color on the corresponding color paper (ie. don’t print the watercolor wash on white paper) Hope that helps, I am not sure I understand the first part of your question. Purple wash on the Kunzite etc, I mixed the washes on different colored paper. Just because of the high use of ink in our office. Hi, I have a technical question that I wanted to get your opinion on. I tried using my mother in-laws heavy duty office laser printer, I bought all the paper you used and when I printed the color seems off to me. The krunzite with the blue wash came off very blue, she has settings on the printer for different colored paper, like if I was printing on blue, pink or red paper etc. I was wondering if the printer you use has the same thing? Or if I should just leave the setting to white paper and print the washes. Trying to figure out if it would change the colors of the washes at all. Thanks! Unfortunately every single printer is different. I would try leaving the setting to white paper. Ok, but regular paper wouldn’t work correct? How do you curl your petals? Is the curling of the cardstock what would make it not look as good? I think Paper-papers.com may have been one place I looked and the packs were in 25 but were pretty expensive and since I won’t need that much of 7 different colors I would hate to buy it and not use it. I wanted to make this as a gift and went looking for the metallic paper in text weight and people had no idea what I was talking about. I tried looking it up online but all I could find were places that sell the colors in large packs that are $30 each and since there are 7 colors that gets expensive. Can I use cardstock for it or is there a way to get smaller amounts of colored paper? Hi Shannon, you could try cardstock but it doesn’t look as good. I get my paper from Paper-Papers.com and I believe they carry smaller packs. I am blessed enough to have a yard full of hydrangaes and yours are as beautiful as the real thing. Thank you so much for having such a sharing heart. A Cricut is in my future, and when I get the hang of it, I want to try this project. Thanks again, you are very talented and I look forward to seeing more of your designs. I’m about to embark on this project with both my sister and niece (I’m cutting the paper for all of us!). I bought the smooth polystyrene balls and am wondering what glue you used? It’s my understanding hot glue is a no-go with polystyrene. Any ideas? P.S. I’m in PDX, too! I use low-temperature hot glue with polystyrene. Hi Lia! I’ve used one of your hydrangea flower tutorials already and immediately fell in love with your site. I’d like to replicate these hydrangeas but specifically the bloom in the first picture at 1:00. I’d like to make a flower bouquet using just that color bloom. Can you tell me which color paper you used and which wash you used? I’d be so greatly appreciative!! I used the violett paper and then printed the purple wash. It is one of my favorite projects so I hope you will enjoy it too! HOLY MOLY!!!!! This is just amazingly stunning!!! I can see from the tutorial that st is a labor of love, but with just beautiful results!! thanks for sharing how you made this… I am off to stalk the whole rest of your blog, which could take a while, as I see you are a prolific crafter… wow! Yay!! So exciting. So happy to hear that you are finding a lot of inspiration on my site:) The Cricut machine is definately going to make your Life a lot easier. Cannot wait to hear what you think of it and about all the Projects you will be making! Beautiful wreath! I love hydrangea’s, but they don’t grow in Florida. My mom had many back home in New Jersey. Going to give it a try. It is one of my favorite flowers, I grew a few in my backyard:) Hope you have fun making your wreath! Wow this is beautiful. I love hydrangeas! Hi Lia! This wreath is stunning – thank you for the instructions/files/paper source! I’m having a problem with cutting the petals with the Cricut Explore. When I import the .png file it will only allow me to print it. If I convert it to an svg file, it cuts each petal twice – like there are 2 paths. I also don’t think I’ve sized it correctly. Do you have any advice or a shared Design Space project you could pass along? Also, sign up for the two free weeks at Creativebug and you can watch my tutorial on how I made these. WOO HOO! Thanks!! a week ago i found your site and LOVE IT!! thanks for sharing such beautiful tutorials… great teacher and so sharing woman!! I will download that, Thanks Lia! Great. Let me know if you have any problems! OMG! I LOVE this wreath, you do beautiful work. I want to try and create this for my door…but I am not too sure what you mean by “printed them with a watercolor wash on a laser printer” I am not to sure how you do this. Thanks in advance. Hi Andrea, there is a link for the water color design which I printed on colored paper to give the effect of different shades on the petals. I love your Paper Hydrangea Wreath!!! Hydrangea is one of my favorite flowers! That was a motive to bought yesterday all the things I need to make this wreath too! … But in Germany it is difficult to find metallic paper, so I take other paper. I am very happy to find your site on facebook some days ago. I am a beginner in paper flower art (also in Quilling paper art) and you inspire me! 😉 … Have a lovely day and best greetings from Dresden, Germany. Hi Diana, I am so glad to you found me. Welcome! Wow! This is beautiful. I wouldn’t have the patience to make it. Surpassed yourself here Lia .Loving the colour . What can you do to top this one ? Waouuuuhhhhhhh!…………. Quelle merveille encore une fois!…. J’admire! Your work is really amazing! I’m just a beginner in floral art, and the most difficult thing to me is to find these wonderful metallic papers. Here in Spain there isn’t such a variety like paper-papers.com offers and the Cricut Explore has not arrive yet… but with my Cameo I expect to be able to do someone of your beautiful projects. Sorry, but my English is pretty rusty! absolutely wonderful! But I would like to ask you what punch do you use for the petals (flowers) because I think it is very difficult to cut with scissors, is’nt it? Hello, I use a Cricut Explorer to cut my flower petals. However there is a punch that Martha Stewart makes for Michael’s for hydrangea flowers that you could use. I wanted to ask you about your laser printer. I see that you use it a lot. Do you think that it is better than an inkjet printer and worth the investment? Also, I have seen that there is a wide variety of prices from very expensive to much cheaper ones. What do you recommend? Thanks again for your sharing your great talent and inspiration! Hi Mary, the laser printer I have it is a heavy duty office printer. To get laser printer quality in smaller quantity I would recommend taking your file to an office supply printer such as FedEx Kinkos etc. Happy Fall! Call me crazy but I love it;-) I do have a Cricut Explorer thought which makes the cutting a breeze. I nearly fell off my chair! It is spring here in Australia but I love hydrangeas! Gorgeous! Love the colors. Pinned and I’ll share on Facebook soon. Thank you Sharon for your support and social media shares! This is absolutely stunning! Every time you post a new flower or flower arrangement, I always say “This is my favorite” but I have to say this is my favorite of all. Thank you so much for sharing it with us. Striving for a new favorite – sounds like a challenge to me;-) Have to say that this is one of my favorites too!